When my friends come to town to see the sights of Washington, DC, they know what they want. They want to see the Smithsonian, of course! So I ask them, which one? Confusion sets in. So let’s back up. What exactly is the Smithsonian and why can’t I just take you there? The Smithsonian is the world’s largest museum and research collection with 19 museums and galleries plus the National Zoo. This enormous collection of history, art, and culture from all corners of the globe is open to the public all year for free! Two of the Smithsonian museums are located in New York City – the American Indian Museum New York and the Copper-Hewitt National Design Museum. For this post, we’ll be focusing on the ones in DC. Right, okay, so which one should I visit? Send me to the most popular museums: The popularity of the Smithsonian museums varies slightly by rotating exhibits. However, the most recognizable museums are The Museum of Natural History, The American History Museum, and The Air and Space Museum. I’ve been to the popular museums already. What’s new? The newest museums include the African American Museum and the newly renovated Renwick Gallery. The Hirshhorn Museum is also very popular because of the Infinity Mirror exhibit. The exhibit has moved on so now you don’t need tickets to enter. Also, be on the lookout for the newly renovated Freer Gallery and Slacker Gallery in October 2017. I am an American history buff: The obvious choice for American history is the American History Museum but you can also find all of the Presidential portraits on display in the Portrait Gallery. It is important to note that historical documents like the Declaration of Independence and the Constitution are on display in the National Archives which is not part of the Smithsonian. Science is more my thing: I’ve always been fascinated by space so I usually head over the Air and Space Museum to get my science fix in the city. The Air and Space Museum features tons of space and aviation artifacts but keep in mind, the bigger aircrafts are at the Udvar-Hazy Center in Chantilly, Virginia. Earth history can be found at the Natural History Museum and includes exhibits of oceanography, geology, and human origins. The National Zoo is another great place for animals and habitat conservation. I want to see art: Hit up any of the galleries or sculpture gardens. On the National Mall, you’ll find the Renwick Gallery, Freer Gallery, Slacker Gallery, and the Hirshhorn Museum. Or hit two birds with one stone in Chinatown at The Portrait Gallery and American Art Museum – located right next to each other. There is also a beautiful photography exhibit at the Natural History Museum. I need to keep the kids entertained: Any of the Smithsonian museums are appropriate for kids. Just pick the one that best peaks their interests! 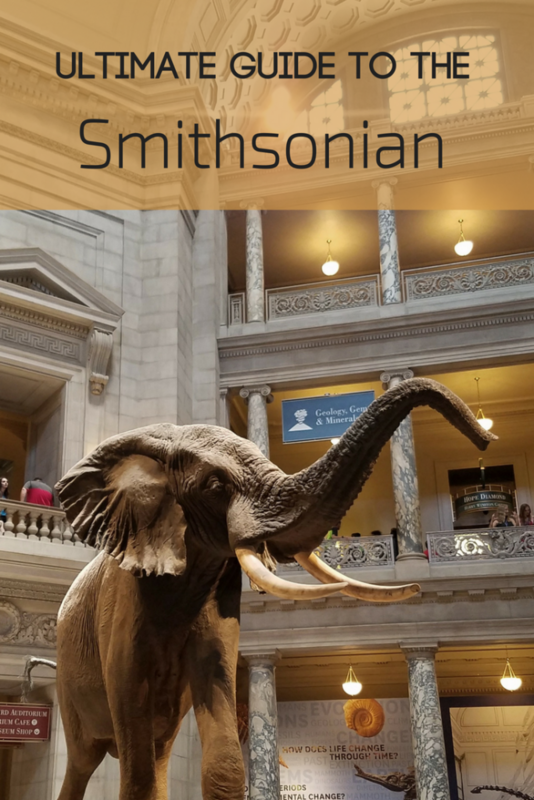 However, if you are looking for a museum with a wide variety of things to see and lots of space to roam, check out the Museum of Natural History, both Air and Space Museums, and the National Zoo. I want to see a museum while I visit the National Mall: The majority of the Smithsonian museums are on the National Mall. It’s easy to pop in a museum while also exploring the city’s most popular monuments. Check out our list below of all the museums on the National Mall. How do I get the most out of my visit? Get up early or go two hours before closing to avoid most of the crowds. Plan to attend a highlights tour. Most of the museums offer free daily tours which usually cover the most popular exhibits and a few hidden gems. Attend during off peak season. Most of the tourists are in town during the summer and cherry blossom season. The African American Museum is the newest member of the Smithsonian. It is the only national museum to be entirely dedicated to African American life, art, history, and culture. Due to its extraordinary popularity, the museum requires (free) timed passes. Find them on the website. The African Art Museum is dedicated to collecting, studying, and conserving art from Africa. The museum features traditional and contemporary art from all countries on the continent. The Air and Space Museum features exhibits highlighting hundreds of artifacts related to aircraft, spacecraft, missiles, and rockets. You’ll find the 1903 Wright Flyer and many demonstrations on how things fly. There is also a planetarium and IMAX threatre. Keep in mind: many of the larger aircrafts are housed at the Steven F. Udvar-Hazy Center in Chantilly, Virginia. The American Indian Museum is one of the largest and most diverse collections of Native American art and historical artifacts. The museum’s architecture, landscaping, and exhibitions were all designed in collaboration with Native American tribes and communities. Take beautiful photos of the museum’s unique architecture and try the Native inspired menu at the cafe. Close those history books and see our nation’s evolution up close at The American History Museum. Exhibits feature colonial history, the evolution of money, American technology innovation, and pop culture artifacts. Don’t miss Dorothy’s ruby slippers or the flag that inspired the Star-Spangled Banner. The Natural History Museum is arguably one of the most iconic Smithsonian museums – best known for the giant elephant in the rotunda and the Hope Diamond. Discover additional gems and minerals, oceanography, dinosaurs, and human origins. Plus, don’t miss the gorgeous Nature’s Best Photography exhibit which is updated annually. The Freer Gallery of Art features Asian art from Neolithic times through the 20th century. Highlights include Chinese paintings, Indian sculpture, and Korean ceramics. It is currently closed for renovation until October 2017. The Hischhorn Museum and Sculpture Garden features stunning contemporary art and a beautiful sunken sculpture garden. The Renwick Gallery just completed a major make-over and celebrates contemporary American art. The gallery is just steps from the White House so make time to see both! The Sackler Gallery is one of two museums in the cities that features Asian art. The second is The Freer Gallery (see above). The gallery features South Asian sculpture, Chinese jades and bronzes, and modern Japanese ceramics. It remains open while the Freer Gallery is under renovation but will close on July 10. Both galleries will reopen together in October 2017. The Smithsonian Institution Building – more affectionately referred to as “The Castle” – is more of an administration building than a museum. As the nickname suggests, it’s a beautiful building so make sure to stop for pictures. Plus, you can start your Smithsonian adventure here to pick up some brochures and see a model of the city. There’s also a cafe and free Wi-Fi if you need to look up any info before your day in the city. The American Art Museum features paintings, photography, and sculptures of and by the American people. It is one of the largest and most inclusive collections of American art in the world and is a beautiful celebration of all of our country’s people. The Portrait Gallery tells the story of famous (and infamous!) people who have left a lasting impact on our country. Follow the stories of artists, presidents, activists, and actors from pre-colonial times through today. Plus, the museum is home to the only complete collection of President portraits outside the White House. Located in the historic DC City Post Office near Union Station, The Postal Museum is particularly beautiful. Learn about the history of America’s mail service and stamp collecting. The Anacostia Community Museum celebrates the impact of historical and contemporary social issues on urban communities. Exhibits change often at this museum so there is always something new to see. The National Zoo is home to over 400 different species including elephants, small mammals, reptiles, and pandas. Visit all of them and learn how to make a difference in saving the natural habitats of all of our animal friends. There were so many amazing artifacts at the National Air and Space Museum, they had to build The Air and Space Museum, Steven F. Udvar-Hazy Center to hold the rest! At the Udvar-Hazy Center, you’ll find many large scale exhibits that are too big for the museum in the city (like Space Shuttle Discovery!) as well as thousands of small aviation artifacts. Admission to this museum is free but there is $15 parking fee per vehicle and free after 4:00 pm.